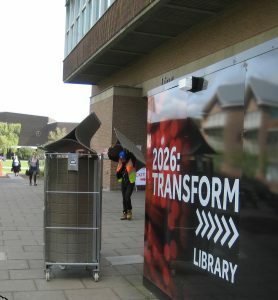 The University of Reading’s capital investment programme, 2026: TRANSFORM, is well under way to improve further our campus facilities. The University Library is undergoing a major transformation – we are investing over £40 million into making it a modern and comfortable place to study, with the very best facilities and learning resources. The project is expected to be completed in 2019. In April 2017, much of the study furniture from the Library was relocated to the URS Building. 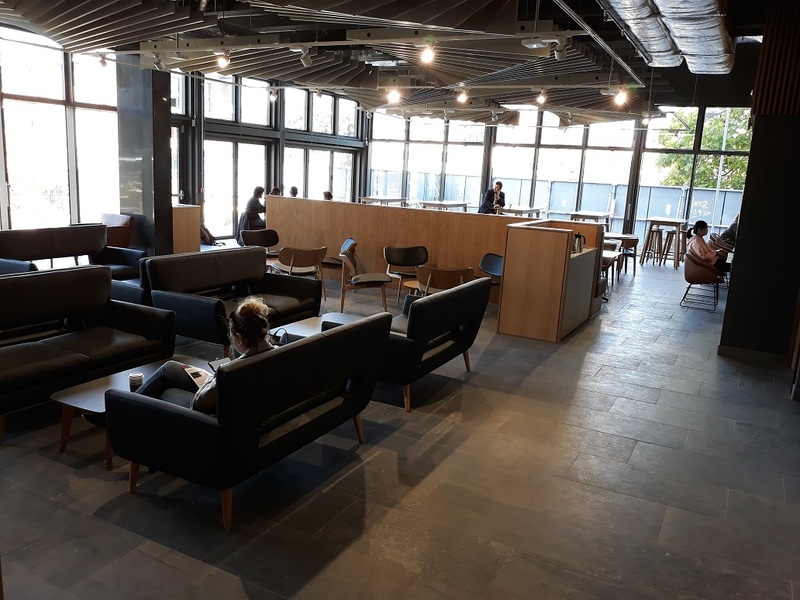 Several key services from the Library Building have also been relocated to the URS Building – the Library Information Desk, Study Advice and Maths Support, the Course Collection, the IT Service Desk and Café Libro. The Library Building remains open for borrowing books. 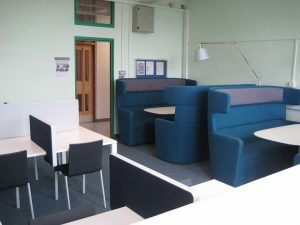 By moving study space and other services to URS, we can provide a quieter environment for study, enquiries and support. It also means less disruption through noise or dust from the building project, with URS still being close enough to borrow and use Library materials. It is expected that these arrangements will be in place until August 2018, when study space and other facilities are currently planned to move back into the Library. The URS lecture theatres have been out of use since the relocation to allow us to accommodate the maximum permitted number of study spaces in this building (there’s a restriction on the total number of people allowed in the building at any one time for fire safety). The University has recently taken the decision to re-open the URS large lecture theatre for teaching in the 2017/18 academic year. Due to the fire safety restrictions in place, this will mean that the number of term-time study spaces available in the URS building will be reduced from around 800 to around 600. This will be disappointing news for some, as the total number of study spaces available to students during term-time will necessarily be reduced. However, please be assured that the University explored every possible alternative option before reaching this decision, but feel it is important that it offers students the best available teaching space for their classes. We will work to re-instate the study spaces during the Christmas and Easter vacations, and in the summer term for the exam period. Café Libro will remain open as usual. Naturally, we will closely monitor the usage of the URS study spaces and the alternative study spaces provided across our campuses (see below for more information) to ensure all spaces are accessible, available and well-used. Feedback from students on these spaces is very much welcome as it will help us to plan study space availability in the future. Taking into account the reduction of study spaces in the URS Building, there are still over 1,500 study spaces available across the Whiteknights and London Road campuses. 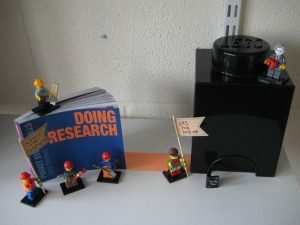 All of these resources can easily be found through the Library Refurbishment Project page. Do bookmark this page on your laptop or mobile to find it easily later. We are also working with RUSU to create a new study space map which we will share with you as soon as it is ready. 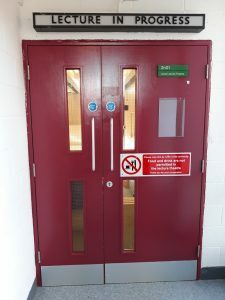 Do not forget too that rooms located in teaching buildings will be subject to departmental use – and as always, please treat all spaces with respect. we are nearing the end of the demolition of a staircase on the south side of the building – a major phase of work that makes room for new, bigger lifts and a replacement staircase. We are, of course, taking measures to reduce the risk of noise wherever possible, but please do remember that this is a live construction project – noise will be unavoidable from time to time. As a way of reducing disruption throughout the day, noisy work will cease after 10:00 during term time. The latest project news is shared through the Library blog – keep checking for updates. Major news will also be shared through the Me@Reading student portal and more. Please contact library@reading.ac.uk in the first instance if you have any queries. Full details of the refurbishment, including FAQ, project summary, latest news and study space links, are available on our dedicated Library Refurbishment Project website. One of the new group study rooms relocated to the URS Building. Much of the study furniture from the Library has relocated to the URS Building. It now provides students with a contemporary and versatile space to work and study – including around 800 spaces (145 computers), work areas for collaborative, quiet and silent study, and several key facilities from the Library Building. Including URS, students can now access over 1,700 study spaces across our Whiteknights and London Road campuses. 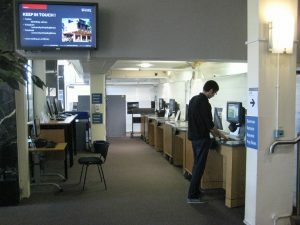 Library Information Desk: For general and registration enquiries, located on the Ground Floor. Study space: A variety of study areas – group, quiet and silent – are available on the Ground and 2nd Floors. Study Advice and Maths Support: Get help with study skills and maths on the Ground Floor. Course Collection: Find key texts for your modules in the Course Collection on the Ground Floor. Holds are also available to collect here. IT Service Desk and facilities: PCs and printing facilities are available on the Ground Floor. If you need help, just ask at the IT Service Desk there. Café Libro: The Library’s popular café is located on the 2nd Floor of the URS Building. Opening Hours: The URS Building will adopt the 24 hour opening during term (except closing 21:00 Saturday to 08:30 Sunday) as is currently the case in the Library. Take a look at the map and floor directory to see what’s been moved where. Rooms have been configured to meet a wide range of study needs – you’ll find individual study booths, group areas, quiet study spaces and more. We have improved several of the building’s existing features in order to make it a better place to study – new lights have been fitted to make studying easier, and south-facing windows on the Second Floor have been tinted to deflect heat. We have balanced creating a maximum number of spaces with ensuring that students can study in comfort and safety. Health & Safety guidelines recommend that URS holds a maximum capacity of 800 students. Our job as a University is to provide students with comfortable spaces to study, and we believe that URS will prove to be a popular home to Library study space until summer 2018, when facilities will move back into the Library Building. Why has the space moved? Relocating study space and facilities from one to building to another posed several benefits. Moving study space from the Library into URS will provide a quieter environment for study while still being close enough to borrow and use materials. It also means we can carry out more work inside the Library than previously planned, and so will complete the refurbishment around six months earlier. With URS in such close proximity to the Library, you won’t have far to take the materials you’ve just borrowed from the original Library building for studying. Printed materials: All printed material (other than Course Collection) will remain inside the Library for borrowing or reference. Library staff: Although Library staff are now based in URS, they will still offer a Help Point by the Library entrance and Information Desks on the 2nd and 4th Floors. Opening Hours: The Library Building will open 09:00-22:00 seven days per week during term time. URS will be open 24/6+ during term time (closed Saturday nights). Construction work will continue in the Library Building whilst we strive to complete the project as soon as possible, so you may experience considerable noise whilst using this building. Including URS, there are approximately 1,700 spaces to study on campus (subject to teaching timetabling and departmental use). The list of alternative space highlights available spaces across our Whiteknights and London Road campuses. RUSU’s The Study and The Study@TOB2 offer additional study spaces to all campus card holders. The Free Room Finder enables students to find rooms available for immediate use. While we have taken great care to ensure that URS meets your needs, we appreciate that there may be more to improve over the coming weeks. Please pass on any feedback or comments to library@reading.ac.uk. A dedicated URS Building page has been created to help clarify exactly what has moved from the Library. It will be kept updated by our Library team, who will also share regular news and updates via the Library blog. The Library opening hours page lists opening times for both the Library and URS buildings. Further details of the Library’s major £40 million refurbishment can be found on our Library Refurbishment Project webpage: www.reading.ac.uk/library/refurb. We re-open on the 2nd Floor of URS at 08:30 on Tuesday 18 April and will be into our extended hours after that. New self-service machines for snacks and drinks will be provided after the move to the URS Building. Your can eat your own cold food in Cafe Libro but hot food, including takeaways, are specifically excluded from Library areas by Library rule 14. Alternatively, check out University Catering’s other campus outlets. We’re getting ready to run Library services and facilities from two buildings from 18 April: the URS Building (no 33 on the Whiteknights campus map) – further away from construction noise – and the Library Building (no 2 ). We are preparing URS signage and our webpages will show where everything is from this date but here’s a preview! 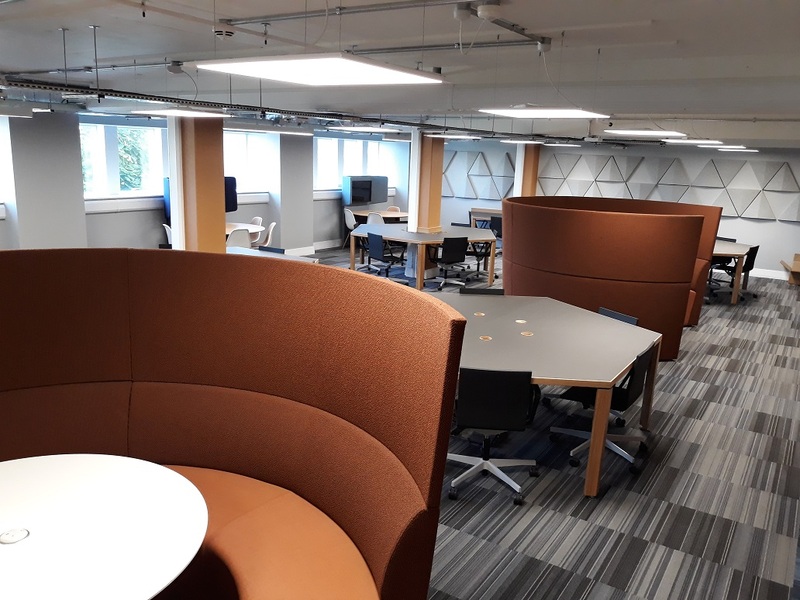 We will move modern study furniture (with power sockets) currently on 2nd, 3rd, and 4th Floors of the Library Building into the the URS Building 2nd and Ground Floors, mainly over the Easter vacation. Some of the 16 large 2nd Floor rooms will be designated as group study space, some quiet study and some silent study space. The silent study rooms will contain some more traditional desks and some individual workbays. The URS Ground Floor will mostly consist of 145 fixed PCs, with printing facilities nearby. Our Course Collection of in-demand texts on reading lists will move to the URS Ground Floor, along with study space and Self-Service Points to borrow and return Course Collection items. You may also save yourself a short walk and return Library Building items here too. CaféLibro will transfer to the 2nd Floor of the URS Building. The URS Building will adopt the 24 hour opening during term (except closing 21:00 Saturday to 08:30 Sunday) as is currently the case in the Library. For security reasons, everyone will enter URS by the one main entrance, closest to Whiteknights House, by the pond. We will adopt the same security that we employ now for the Library and transfer this to the URS building. You will be able to borrow all printed material (other than Course Collection items in URS) from the University Library, open 09:00-22:00 in term.There will be no study desks in the Library Building so you will need to take them either to the URS Building or find alternative study space on campus (see top right of Library Refurbishment Project page). We recognise this is less convenient than having printed books in the same building as study space but hope that the Library hours we have been able to achieve will serve the majority of students – our usage statistics show that almost all borrowing activity occurs before 22:00. Library staff will be on duty to help you during core hours. Construction work will continue during weekdays in the Library Building whilst we strive to complete the project as soon as possible, so you may experience considerable noise whilst using this building. 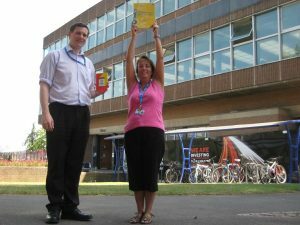 For further information, see the Library Refurbishment Project page at www.reading.ac.uk/library/refurb. If you have a disability and have any concerns about using either the Library or URS Building facilities, please contact Matthew Holtby, Library Disability Co-ordinator. If you have any other queries, please email library@reading.ac.uk. The University will shortly be able to offer the URS Building instead of studying in the Library during its major refurbishment. We will be moving furniture and IT equipment from the Library into URS so that students can study in a comfortable and quiet space away from construction works. Studying in URS will be quieter as it is further away from Library building works. The URS Building will be open 24 hours in term (except Saturday night) just like the Library is now. Course Collection will move into URS to maintain full access. Books will remain in the Library and will be borrowed as usual. Although Library staff will be based in URS, they will also run an information service in the Library building to help you find and borrow books there. Using URS means the refurbishment will be finished earlier than originally planned. 838 study spaces (including 145 computers) will move into URS along with Library staff – so there’ll always be someone on hand to help. Cafélibro will also relocate to URS. All books (excluding the Course Collection) will stay inside the Library and will be available to use and borrow as usual. The Course Collection will move into URS and will continue to be accessible for 24 hours in term-time, as the Library offers now. As well as providing a quiet and convenient alternative space for students, using the URS Building will mean that the length of the refurbishment programme will be shortened by approximately six months, ending mid 2019 as opposed to late 2019 / early 2020 as originally planned. The URS Building was vacated in December 2016 in preparation for the building’s own major redevelopment – as the programme is still under revision in light of the URS Building’s grade two listing, the University is now in a position to offer it up as relief space to students. We expect URS to be available until at least August 2018. “RUSU is committed to campaigning for more study space and better facilities for students on campus. We highlighted that the University must do everything it can to mitigate issues such as noise from the building work and access to books, especially for students currently studying here. The University is working hard to implement these plans ready for the 2017 Quiet Period. Logistics are still being finalised – we will share final plans as soon as possible. If the move is at risk of affecting the exam period it will be postponed until after exams have finished. Don’t forget that as well as the URS Building, there are many additional alternative study spaces around campus – a full list is available online and our Free Room Finder helps identify available rooms on a daily basis. For more details of additional study space available on campus, project benefits and the latest news, please visit the Library Refurbishment Project webpage. Remember we changed Library rules to allow you drinks in the Library – as long as they’re in lidded containers? And Cafélibro give 5% off drinks in your own cup? … But you need a lidded travel mug inside the Library? Keeping a lid on it in the Library! 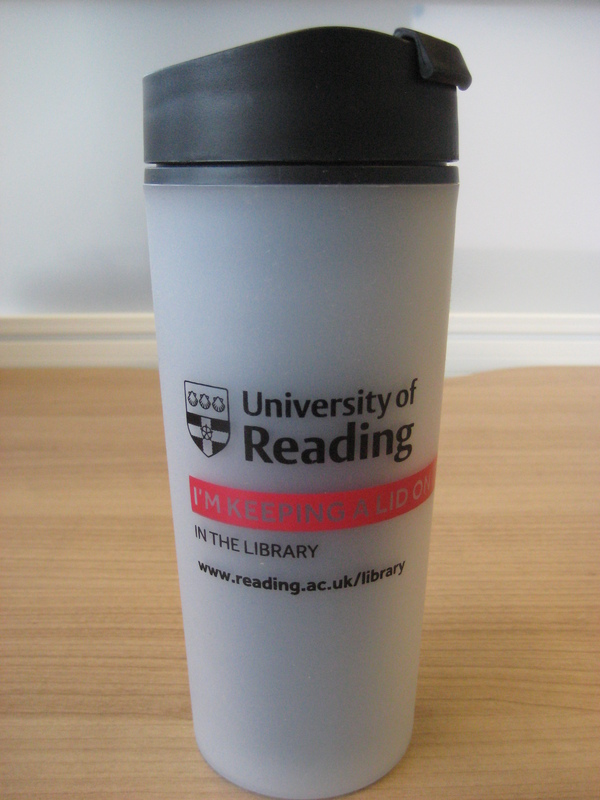 Cafélibro are now selling our latest style of Library lidded mug – still at £5.00, still a competitive price! Our Mark 2 design holds 450ml, is grey with a black lid and bears the statement ‘I’m keeping a lid on it in the library’. Treat yourself! Make your statement with ours! Drinks – yes; food – no! Please note that whilst our rules still ban food from the Library, you can eat cold food in the café. Hot food, including takeaways, is not permitted anywhere in the building. However, we look forward to forthcoming Library refurbishment which brings new opportunities in an enlarge the cafe! See what the architect plans on our website. A £40 million redevelopment and refurbishment of The University Library starting this June, has been approved by the University Council. This second phase of the complete modernisation and revamp of the Library will increase space for individual and group study, and will make better use of the space currently available on the Ground and 1st Floors. Work is anticipated to be completed by the end of 2019. Specific key areas of improvement will include 200 more study places and increased toilet capacity with toilets available on all floors, including disabled and gender neutral provision. Café space will be expanded, including opening glazed doors onto external al fresco areas. New lifts will be installed, and an improved system for borrowing and returning books will be put into place. The redevelopment will provide better access and security as well as improving its energy efficiency, through improved insulation and ventilation. The exterior of the building will be totally re-clad and will have replacement windows fitted throughout, providing a striking focal point at the heart of the Whiteknights campus. 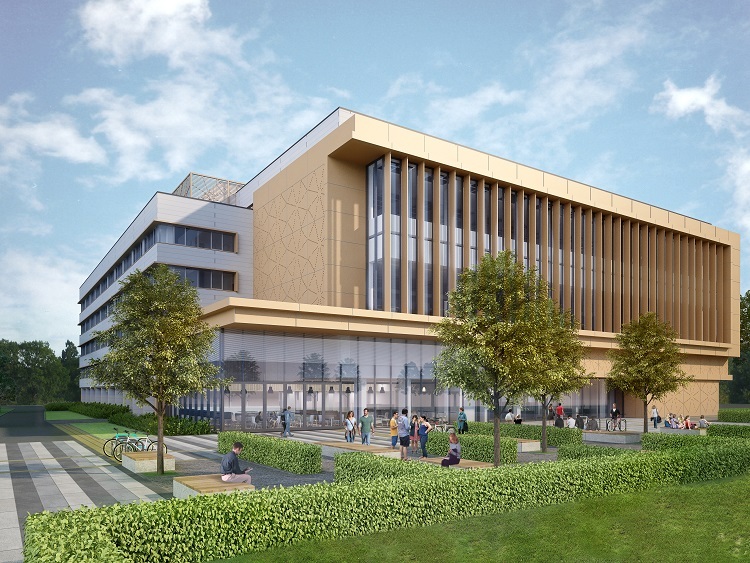 The University Council approved the £25 million building costs, with an additional £15 million costs of keeping the Library fully operational, contingency funding, VAT and project management. This comes after the first £4.4m phase revamped the study spaces and furniture on the 2nd to 5th Floors in 2013 and 2014. Planning permission was granted by Reading Borough Council last December. Keep calm, we’ll carry on! The Library will remain fully operational to students across the entirety of the redevelopment. No building work will take place at all during exams. To minimise disruption for Library users, books held on floors being refurbished will be relocated elsewhere in the Library. Print journals will move off site, but as the majority of Library users access journal content online via the Library website, this should cause minimal inconvenience. 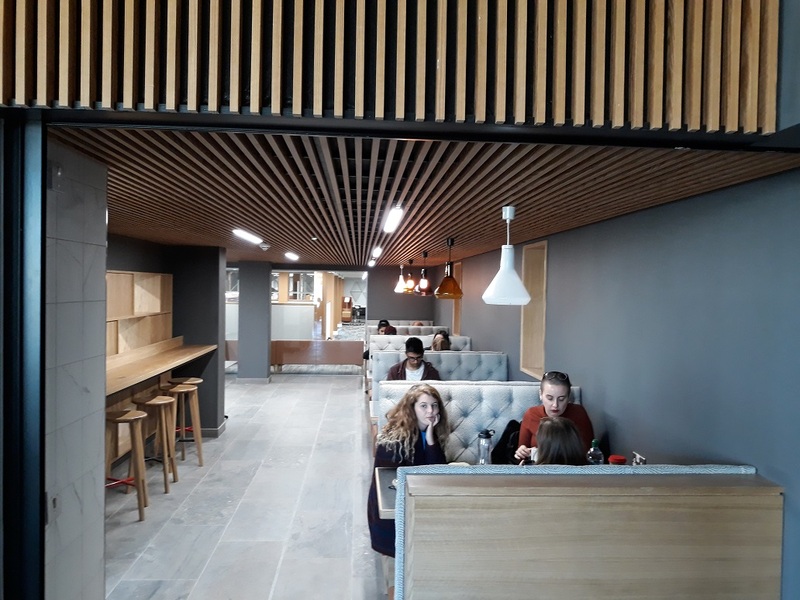 In addition, the University will provide alternative study space across the centre of the campus during exam and periods of high-demand – with details being confirmed in due course. A wider Campus Projects website is also in development, in which the Library redevelopment will be featured. Many other communication channels will also be used to help provide as much information as possible across the development of the project.